“SUPERSTARS OF FLAMENCO!” * THURS. MAY 9 * HOLLYWOOD ALFONSO LOSA & VANESA COLOMA* WORKSHOPS: WED. MAY 8 NOHO; SAT. MAY 11 ORANGE 10th Festival ‘Cumbre Flamenca’ * Fri. Jun 7 * The Broad Stage, Santa Monica / Workshops June 1-10 PIRAÑA & FRIENDS CONCHA JAREÑO IN SO. CALIFORNIA / THANK FOR 2 SOLD OUT SHOWS L.A.! SHERRY FROM THE BODEGAS OF JEREZ DE LA FRONTERA …THE NOBLE WINE! SEVILLA, CAPITAL OF ANDALUSIA AND A FAVORITE PLACE FOR QUESO Y JAMÓN, MAINSTAYS OF SPANISH CUISINE. Did Somebody Say Flamenco? ¿Ha dicho alguien flamenco? 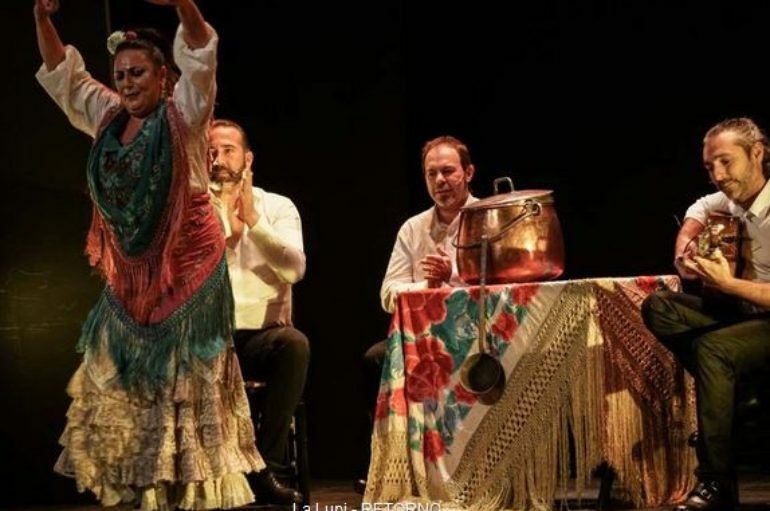 La bailaora La Lupi, presentó “Retorno” en los lunes flamencos del Teatro Flamenco Madrid, 15 de octubre 2018. Con Alfredo Tejada y David el Galli al cante y Curro de María en la guitarra. IVÁN VARGAS SHOW SOLD OUT! / Sunday, May 6, 2018 / 3-City Workshop Tour! VIDA FLAMENCA presents a vibrant spectrum of flamenco dance and music workshops, Masterclasses & productions from traditional Gypsy roots to contemporary interpretations represented by some of the world’s finest Spanish dancers and musicians of today. We are a Los Angeles-based 501 (c) 3 nonprofit organization offering cultural enjoyment for all ages through our programming. As producers, artists, instructors and ambassadors of Spanish and Flamenco arts, we uphold our commitment to education through exposure and exchange so others may engage in this profoundly creative form of expression. Direct from Madrid ‘Superstars of Flamenco’ in Hollywood May 9! In Hollywood * May 9 *Alfonso Losa, Vanesa Coloma con ‘El Bola’ y Antonio Sánchez!!! Flamenco, a unique symbol of Spanish culture and brand of Spain. © 2015 Copyright Solidus theme. All Rights reserved.